Ever since first got into Thrash Metal, I have thought of the German scene as a gold mine that keeps popping some of the most brutal bands on the planet. Thankfully, I have never had any reasons to think otherwise, and Obsessör is no exception. 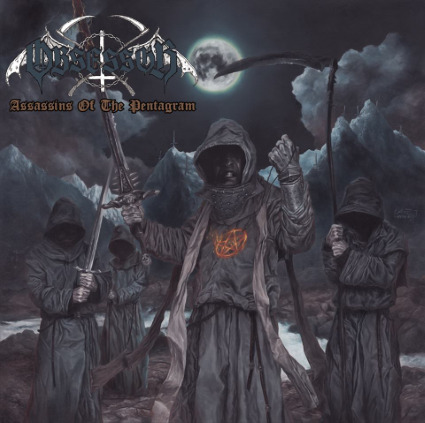 Assassins Of The Pentagram, their second full length studio release, presents a well-balanced mixture of the typical “punch-in-the-gut” German sound with denser Black Metal moments. The first track, Return Of The Usurper, put me back in my place in a blast beat (ha!). After an interesting opening guitar riff, the drums shortly spice up the textures with simple unconventional (for Thrash) rhythms, a pattern that would be repeated throughout the album. At no point however, do the pieces devolve into a disjointed collections of riffs. Although most of the album sounds like 80’s Thrash (I rejoiced every time I heard a high-pitched scream) with hints of Black Metal, mostly in the intros, some tracks show heavy NWOBHM influence. Fullmoon Procession, Necromancer, and , Black Speed Thunder, in particular, sound like the possessed offspring of the Tygers of Pan-Tang. As a fellow guitar player (or Speed metal Scythist, if you will) I feel compelled to congratulate Genözider for his interesting riffs and well-put together solos. One of my biggest pet peeves regarding to Thrash is the excessive presence of aimless shredding (my bad, Kerry King), which does not occur in this album. Obsessör is definitely going to become a regular on my playlists. With cutting vocals, aggressive guitar and bass, and surprising drums, Assassins Of The Pentagram is a welcome blast of creativity in a genre that has been struggling to find originality without abandoning its roots. It is a great album, but most importantly, it is brutal as hell.